Dallas Cowboys quarterback Tony Romo (9) watches from the bench against the Washington Redskins in the fourth quarter at FedEx Field. The Cowboys won 24-23. Minutes after Dallas Cowboys head coach Jason Garrett revealed that Tony Romo had back surgery Friday morning, Jerry Jones was already discussing the quarterback’s future. "My expectation is that one of the pluses for having had it done as early as this morning is that it would really contribute to him being able to get right there when it comes time for the team to be in OTAs and do the preparation, the beginning of the preparation for next year," Jones said on 105.3 The Fan [KRLD-FM]. "The OTAs are what we call the equivalent of our spring practice. So we would anticipate him being right on time there and expect it and we’ll see how it goes." 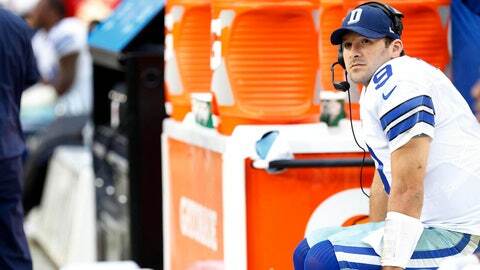 The Cowboys owner and general manager also said that a 33-year-old Romo having a second back surgery in the past eight months will not force him to spend an early-round draft pick on a quarterback in May. "You’d like to every spring pick up a quarterback," Jones said. "I think the real issue and maybe your question would be, ‘Would you seriously consider using a significant draft pick for a quarterback?’ That’s early. That’s way too early to do that with the way things are today with my expectation of Tony’s career, which I think will be for several years to come, it’s too early to be drafting a highly ranked or if you will costly quarterback." 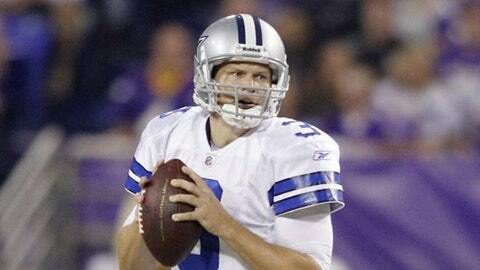 The Cowboys have not drafted a quarterback since using a fourth-round pick on Stephen McGee in 2009.